As our Annual AGM and Symposium draws near, we continue to look back at our 40 years of development cooperation in the Atlantic region. We have sought reflections on this 40-year history from individuals who have been involved in development cooperation in the Atlantic region. One of which is Bill Hynd, who our board member Brian Tomlinson interviewed to discuss his active engagement and work in the Atlantic region over the years. Bill Hynd worked for 30 years as an educator and campaigner for Oxfam St. John’s in support of global development, international solidarity and human rights. 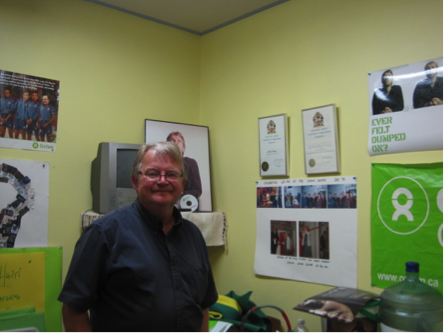 During these 30 years, Bill was staff for the St. John’s Oxfam Center, an independent Oxfam organization in Newfoundland, then a regional staff for Oxfam Canada, and ended his career with Oxfam as national campaigns coordinator, based out of the St. John’s Oxfam Center building. For over 40 years, the Oxfam house served as a centre for community life. When Bill left Oxfam in 2014, Oxfam St John’s was one of only two regional offices remaining, out of a dozen local offices at the peak of Oxfam Canada decentralization in the 1980s and 1990s. Tragically, the Oxfam house was lost in a fire that destroyed the building and all its contents in September of 2013, and Oxfam Canada decided not to rebuild its presence in Newfoundland, a year later. Dominique Marshall, a professor at Carleton University, has a three-part podcast on the history of the St. John’s Oxfam Center here. A photo exhibition of the Center can be found here. Bill current works for the Newfoundland Federation of Labour. In this podcast, Bill reflects on the importance of making local connections and an interest in solidarity with people around the world, which drew him into global development and work with Oxfam over three decades. In this interview he speaks about the importance of drawing upon Newfoundland’s own direct experience in development in areas such as resource extraction, the fishery, education for all, and HIV/AIDS in making meaningful connections with people facing similar issues in the global south. Please enjoy the interview below, or download and listen later!